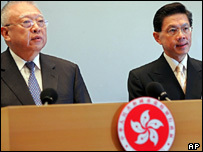 Hong Kong's leader Tung Chee-hwa has announced the resignation of Health Secretary Yeoh Eng-kiong. Dr Yeoh was among several officials criticised in a recent report on the handling of last year's Sars crisis. He was accused of paying too little attention to Sars when it appeared in mainland China, and issuing misleading public statements. Sars killed 299 people in Hong Kong between March and June 2003. Mr Tung praised the health secretary for improving the quality of Hong Kong's health system, but said he had accepted his resignation to help ease public concerns. Analysts say Dr Yeoh's departure will help ease the pressure on Mr Tung's unpopular administration. Less than a week ago, a huge rally demanded more democracy in Hong Kong, and Mr Tung is under fire from opposition leaders for not pushing for more autonomy from Beijing. Mr Tung announced his health secretary's resignation at an evening press conference, with Dr Yeoh standing beside him. The departing minister spoke briefly, saying it had been an "honour" to serve Hong Kong for 33 years. The BBC's Chris Hogg in Hong Kong says members of all the main political parties in the territory had asked Dr Yeoh to step down in the wake of Monday's damaging report by a committee of lawmakers. The pressure on Dr Yeoh mounted still further on Wednesday - with first the relatives of Sars victims, then the leaders of both opposition and pro-government parties saying he had to go. In their report, Hong Kong's lawmakers highlighted what they called the health secretary's confusing and often misleading press conferences. They said his statements gave the impression the government was attempting to downplay the seriousness of the Sars outbreak. Dr Yeoh is expected to stay in his job for a few months until a successor can be found.